An interesting game for Fuerza Regia (25-7) which hosted in Monterrey second-best Mineros (23-9). First ranked Fuerza Regia managed to get a 10-point victory 83-73. Fuerza Regia looked well-organized offensively handing out 21 assists. It was a good game for Nigerian center Jeleel Akindele (216-83, college: Chicago St., agency: BeoBasket) who led his team to a victory with 17 points, 7 rebounds and 6 assists. Puerto Rican swingman David Huertas (195-87, college: Mississippi) contributed with 18 points and 7 assists for the winners. American guard Eric McClellan (193-93, college: Gonzaga) answered with 17 points for Mineros. Fuerza Regia have an impressive series of nine victories in a row. They maintain first place with 25-7 record. Mineros at the other side keep the second position with nine games lost. Fuerza Regia are looking forward to face Huracanes (#7) in Tampico in the next round which should be theoretically an easy game. Mineros will play against Lenadores (#3) and it may be a tough game between close rivals. An interesting game for Capitanes (20-11) which hosted in Mexico 4th placed Panteras (15-15). First ranked Capitanes had an easy win 98-74. Panamanian guard Daniel Giron (193-89) stepped up and scored 19 points and 7 rebounds for the winners and Ismael Romero chipped in 18 points and 9 rebounds (on 8-of-9 shooting from the field). Capitanes' coach felt very confident that he used 10 players which allowed the starters a little rest for the next games. The best for the losing side was American guard Hameed Ali (188-93, college: Texas A&M-CC) with 20 points, 7 rebounds and 7 assists. Capitanes maintains first place with 20-11 record. Panteras at the other side keep the fourth position with 15 games lost. Capitanes will play against Abejas (#5) in Guanajuato in the next round. Panteras will play at home against Libertadores and it may be a tough game between close rivals. The game in Tampico was also quite interesting. 6th ranked Santos (11-21) played at the court of seventh ranked Huracanes (6-24). Huracanes managed to secure a 7-point victory 108-101 on Saturday. Martin Samarco nailed a double-double by scoring 31 points, 10 rebounds and 6 assists for the winning side. Lyonell Gaines came up with a double-double by scoring 29 points and 10 rebounds for Santos in the defeat. Newly promoted Huracanes maintains seventh place with 6-24 record. Loser Santos keep the sixth position with 21 games lost. Huracanes will meet at home league's leader Fuerza Regia in the next round and it will be quite challenging to get another victory. Santos will have a break next round. There were no big surprises in other games of round 33: Laguneros were beaten by Lenadores on the road 102-92. Soles won against Abejas on its own court 92-79. Angeles managed to outperform Libertadores in Puebla 84-76. The most impressive performance of 33th round was 18 points, 6 rebounds and 7 assists by Filiberto Rivera of Angeles. The game in Tampico was also quite interesting. 6th ranked Santos (11-21) played at the court of seventh ranked Huracanes (6-24). Huracanes managed to secure a 7-point victory 108-101 on Saturday. Huracanes made 25-of-30 free shots (83.3 percent) during the game. They looked well-organized offensively handing out 24 assists. Naturalized American guard Martin Samarco (190-85, college: Bowling Green) nailed a double-double by scoring 31 points, 10 rebounds and 6 assists for the winning side and American forward Timajh Parker-Rivera (202-94, college: Towson) accounted for 24 points and 13 rebounds. American forward Lyonell Gaines (198-93, college: Morehead St., agency: Best of You Sports) came up with a double-double by scoring 29 points and 10 rebounds and the other American import forward BJ West (211-89, college: Jackson St.) added 23 points and 15 rebounds respectively for Santos in the defeat. Both teams had five players each who scored in double figures. Newly promoted Huracanes maintains seventh place with 6-24 record. Loser Santos keep the sixth position with 21 games lost. Huracanes will meet at home league's leader Fuerza Regia in the next round and it will be quite challenging to get another victory. Santos will have a break next round. No shocking result in a game when third ranked Lenadores (17-13) beat at home 5th ranked Laguneros (13-17) 102-92 on Saturday. Lenadores made 24-of-28 free shots (85.7 percent) during the game. They looked well-organized offensively handing out 25 assists. American-Puerto Rican Javier Mojica (190-84, college: Cent.Conn.St.) nailed 21 points, 6 assists and 4 steals for the winning side and American-Lebanese power forward Jarrid Famous (209-88, college: S.Florida) accounted for 22 points and 7 rebounds. Jamaican-American guard Akeem Scott (185-83, college: High Point) came up with 23 points, 5 rebounds and 5 assists and naturalized American swingman PJ Reyes (196-88, college: Charleston) added 21 points and 7 assists respectively for Laguneros in the defeat. Five Lenadores and four Laguneros players scored in double figures. Both coaches used bench players and allowed the starting five to rest. Newly promoted Lenadores maintains third place with 17-13 record having four points less than leader Fuerza Regia. Laguneros at the other side, also newcomer in the league, keep the fifth position with 17 games lost. Lenadores will meet league's second-placed Mineros in the next round and it will be for sure the game of the week. Laguneros will play against Correcaminos and it may be a tough game between close rivals. An interesting game for Fuerza Regia (25-7) which hosted in Monterrey second-best Mineros (23-9). First ranked Fuerza Regia managed to get a 10-point victory 83-73. Fuerza Regia looked well-organized offensively handing out 21 assists. It was a good game for Nigerian center Jeleel Akindele (216-83, college: Chicago St., agency: BeoBasket) who led his team to a victory with 17 points, 7 rebounds and 6 assists. 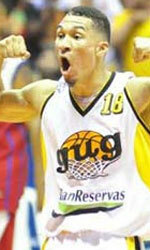 Puerto Rican swingman David Huertas (195-87, college: Mississippi) contributed with 18 points and 7 assists for the winners. Four Fuerza Regia players scored in double figures. American guard Eric McClellan (193-93, college: Gonzaga) answered with 17 points and the other American import forward Wendell McKines (198-88, college: N.Mexico St.) added 11 points and 11 rebounds in the effort for Mineros. Fuerza Regia have an impressive series of nine victories in a row. They maintain first place with 25-7 record. Mineros at the other side keep the second position with nine games lost. Fuerza Regia are looking forward to face Huracanes (#7) in Tampico in the next round which should be theoretically an easy game. Mineros will play against Lenadores (#3) and it may be a tough game between close rivals. An interesting game for Capitanes (20-11) which hosted in Mexico 4th placed Panteras (15-15). First ranked Capitanes had an easy win 98-74. Capitanes dominated down low during the game scoring 52 of its points in the paint compared to Panteras' 32. They outrebounded Panteras 41-26 including a 32-18 advantage in defensive rebounds. Capitanes players were unselfish on offense dishing 22 assists. Panamanian guard Daniel Giron (193-89) stepped up and scored 19 points and 7 rebounds for the winners and Cuban center Ismael Romero (203-91) chipped in 18 points and 9 rebounds (on 8-of-9 shooting from the field). Capitanes' coach felt very confident that he used 10 players which allowed the starters a little rest for the next games. The best for the losing side was American guard Hameed Ali (188-93, college: Texas A&M-CC) with 20 points, 7 rebounds and 7 assists and the other American import Tony Criswell (205-91, college: Missouri) scored 19 points. Five Capitanes and four Panteras players scored in double figures. Capitanes maintains first place with 20-11 record. Panteras at the other side keep the fourth position with 15 games lost. Capitanes will play against Abejas (#5) in Guanajuato in the next round. Panteras will play at home against Libertadores and it may be a tough game between close rivals. Rather expected game when 5th ranked Abejas (13-19) lost to second ranked Soles (19-11) in Mexicali 79-92 on Sunday. Soles looked well-organized offensively handing out 23 assists. American players dominated the game. Guard Aaron Valdes (196-93, college: Hawaii, agency: Pro Sports) nailed a double-double by scoring 19 points and 10 rebounds for the winning side and forward Lance Goulbourne (203-89, college: Vanderbilt) accounted for 23 points and 8 rebounds. Power forward Yancy Gates (206-89, college: Cincinnati) came up with 17 points and 9 rebounds and forward Onzie Branch (198-91, college: Gardner-Webb) added 17 points, 6 rebounds and 4 assists (went 7 for 7 at the free throw line) respectively for Abejas in the defeat. Both teams had four players each who scored in double figures. 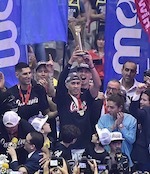 The victory was the fourth consecutive win for Soles. They maintain second place with 19-11 record behind leader Fuerza Regia. Loser Abejas keep the fifth position with 19 games lost. Soles will have a break next round, and it should allow them to practice more before next game. Abejas will play against the league's leader Capitanes (#1) in Mexico and hope to secure a win. We could consider it a predictable result in the game between close teams when seventh ranked Angeles (10-20) won against 6th ranked Libertadores (10-19) in Queretaro 84-76 on Sunday. Puerto Rican point guard Filiberto Rivera (189-82, college: UTEP) nailed 18 points, 6 rebounds and 7 assists for the winning side and American power forward Bryan Davis (206-86, college: Texas A&M) accounted for 15 points, 8 rebounds and 5 assists. American forward Anthony Young (200-89, college: Ky Wesleyan) came up with 18 points and 6 rebounds and the other American import swingman Brandon Davis (198-88, college: Lamar, agency: Pro Sports) added 14 points and 6 rebounds respectively for Libertadores in the defeat. Both teams had five players each who scored in double figures. Newly promoted Angeles maintains seventh place with 10-20 record. Loser Libertadores keep the sixth position with 19 games lost. Angeles will meet at home higher ranked Aaguacateros (#3) in the next round and it will be quite challenging to get another victory. Libertadores will play against Panteras in Aguascalientes and it may be a tough game between close rivals.